Putschists in Berlin. The banner warns: "Stop! Whoever proceeds will be shot". 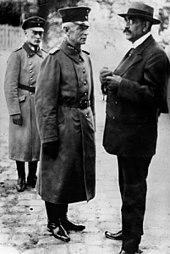 The Kapp Putsch, also known as the Kapp–Lüttwitz Putsch after its leaders Wolfgang Kapp and Walther von Lüttwitz, was an attempted coup on 13 March 1920 which aimed to undo the German Revolution of 1918–1919, overthrow the Weimar Republic and establish an autocratic government in its place. It was supported by parts of the Reichswehr (military) and nationalist and monarchist factions. The coup took place in the capital, Berlin, and the legitimate German government was forced to flee the city. The coup failed after a few days, when large sections of the German population followed a call by the government to join a general strike. Most civil servants refused to cooperate with Kapp and his allies. Despite its failure, the putsch had significant consequences for the future of the Weimar Republic. It was one of the causes of the Ruhr uprising of March 1920, which the government suppressed by military force, whilst dealing leniently with those behind the putsch. These events polarized the electorate, resulting in a shift in the majority after the June Reichstag elections. As a result of a lunatic coup de main, the government buildings of Berlin have fallen into the hands of mutineers. No political party, no man of sober-minded thought is behind these events. They are to be deplored. Since troops that are destined for discharge in Döberitz, namely [troops] from the Baltic, have supported this act of madness, the government—in order to avoid the spilling of blood—has spared the lives of the few regular troops located in Berlin and has departed Berlin. For enough blood has flowed since 1914. And this adventure will collapse in a few days from its intrinsic impracticality. The government has transferred its seat to Dresden. Everyone remains bound in obedience to the constitutional government. Only it can issue orders and payments. Any decree from another place is legally null. The soldiers of the national army have to defend the constitution, protect the president and government, and be obedient. To emulate the breaking of their oath by a number of officers is prohibited by duty and law. The dissolution of the national assembly is unconstitutional. The president of the national assembly has been requested to convene the national assembly again at once. Only a government based on the constitution can save Germany from sinking into darkness and blood. If Germany is led from one coup to another, then it is lost. A government resting on an act of violence lacks authority domestically and abroad. The people will starve if new troubles interrupt the economy and commerce, and trust in the father land, which only a constitutional government earns, will be undermined. Colossal dangers loom internally and externally if the people lose their prudence. Chisholm, Hugh, ed. 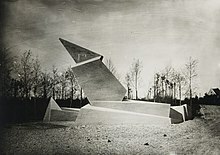 (1922). "Kapp, Wolfgang" . Encyclopædia Britannica (12th ed.). London & New York.